I ended up creating a spreadsheet for quickly evaluating deals. Many of the formulas that I used came from the book “What Every Real Estate Investor Needs to Know About Cash Flow… And 36 Other Key Financial Measures“. My goal was to be able to enter a few pieces of data and quickly analyze a property using multiple formulas. I then wanted a quick way to determine if the property was worth a further look. 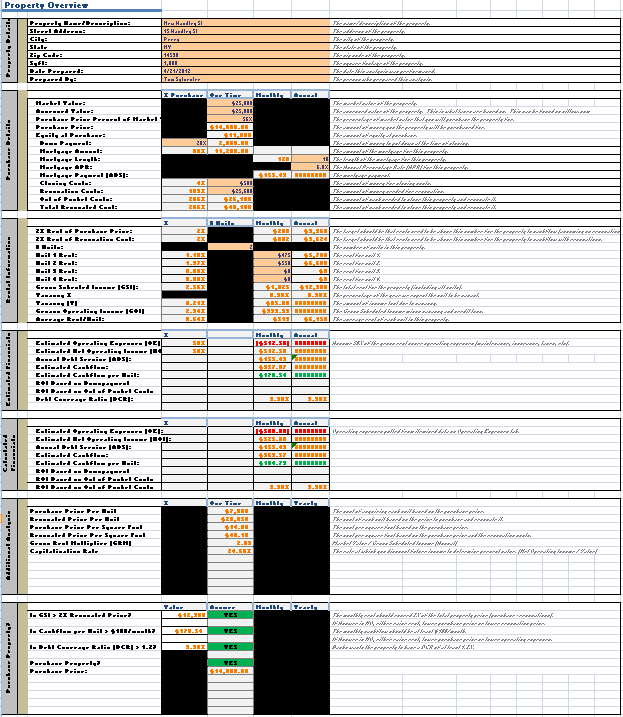 Below is the breakdown of the spreadsheet that I currently use. Want to download a FREE copy of this spreadsheet? Check out our Special Offer – Free Real Estate Evaluation Spreadsheet page to download it.